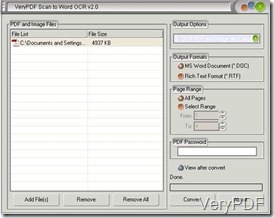 Scan to Word OCR Converter is disigned to help users to convert scanned images or PDF files into editable Word or RTF documents. with this software, users can finidh their work more efficient and professionaly than before. 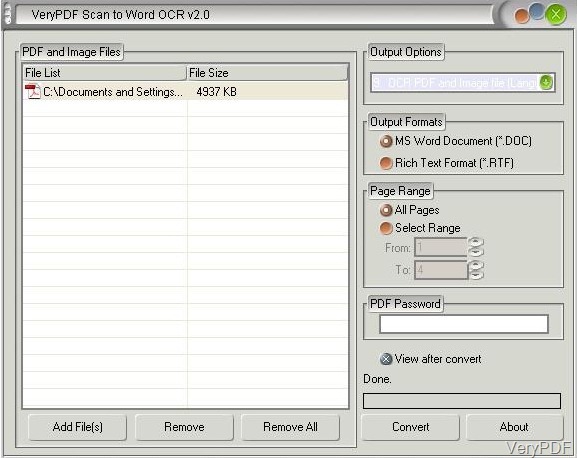 Equipped with the advanced OCR technology in the market, Scan to Word OCR Converter can help users to convert scanned images and PDF files according to their own needs. Different languages. different output formats and layouts and different page range can be achieved with this software. Is it amazing? How to convert scanned images or PDF files into editable Word documents with text only ? Clike the button “Add Files”and put the scanned images or PDF files into the interface. Clear part of the listed files in the interface you can select the files and click the button”Remove”and clear all the files with the button”Remove all”. As to the output layout and different languages of the converted Word documents, the firs group box of the right side of the interface can help. In the combo box, select the second choice”Text Only (No Images)”. Choose the output formats in the next formats, two formats are offered: “MS Word Documents(*.DOC)” and “Rich Text Format (*.RTF)”. In the third group box, the users can choose the page ranges . If all the scanned images and PD files are needed to be converted, select the button “All Pages”; if only specified pages need to be converted, ,select the option”Select Range”and input the page number into “From and To”. Input the right password if the scanned images and PDF files are encrypted pages. Click the button”Convert”and a few seconds later the scanned images and PDF files can be converted into editable Word documents with text only. This software can be free download to your PC and you can try it 20 times for free. If you are in trouble with such problems, do not need to worry anymore and follow the listed steps your problems will be solved. It is worthy to mention that s the resolution of the original scanned images should be high enough so that the converted Word documents can be editable.